﻿ Porter Finance Review - Is Porter Finance a Scam or a Legit Broker? Porter Finance have ceased all operations. Please visit our recommended trading brokers list. Porter Finance is a binary options broker that opened its doors in 2014. The site is operated by a London-based companycalled Running Forest Partners LTD. More importantly they are ran by a respected team of professionals we have worked with for years here at BinaryTrading.org. needed to know about this broker at a glance. Is Porter Finance regulated? No, not yet, but they impressed us with this line in their Terms and Conditions: “USA citizens are restricted on this trading platform from trading currencies and commodities due to U.S. regulation by the CFTC. In short, Porter Finance understands CFTC laws, and is determined to be compliant. A lot of regulated brokers frankly do not understand CFTC laws, and err on the side of overly-cautious by shutting out USA traders altogether. Porter Finance is welcoming USA traders with open arms, but still sticking to the letter of the law. This is very refreshing to see! It is easy to open an account on Porter Finance. Look in the upper left-hand corner of the page and you will see “Open Account” on the menu. Click on it. You will be taken to a page where you can input your first and last name, email address, password, country, phone number, and currency. Look at the right-hand side of the page to view the different types of accounts which are available. To start trading, you need to deposit a minimum of $200. A Beginner Account starts at $250, and includes a 30% welcome bonus, weekly market reviews, and a trading eBook. A Standard Account, the next tier up, starts at $750, and includes a 40% welcome bonus, daily and weekly market reviews, a trading eBook, academy membership and a trading strategy. If you deposit $1,000 or more, you are eligible for the Executive Account. This includes a 75% bonus and all the features mentioned previously, plus VIP academy membership, three trading strategies, 5 risk-free trades, and money management training. If you have $100,000 or more to invest, you qualify for the VIP account, which is the highest account level. Remember, the bonus offers always come with terms attached. Be sure you agree to them before accepting a bonus. If you need to withdraw the money in a timely fashion I advise avoiding a bonus. In short, there are a ton of great resources provided to traders who are new to binary options. Porter Finance is a company that is interested in helping traders learn and grow so that they can succeed with binary options. What should you know about withdrawals? Your first withdrawal of the month is free, after which you have to pay a $30 fee for all additional withdrawals. Wire transfer withdrawals are also $30 (this is quite typical). There is a low minimum withdrawal threshold of just $30 for credit and debit cards or MoneyBookers ($100 for wire transfers). Most brokers require $100 minimum, so this is great. Past that, you have to use wire transfer, and therefore pay a fee of $30, even if it is your first withdrawal of the month. Porter Finance uses the popular SpotOption platform. On this platform, you can trade 59 different assets, including currencies, commodities, stocks, and indices. Typical payouts are around 75%, with out of money refunds up to 10%. The platform itself is easy to use and should be familiar to you if you have done binary options trading elsewhere in the past, since SpotOption is used by so many companies. Also note that you can trade on your Android or iOS device; the download links for the apps are easy to find right at the bottom of the page. Sadly, there is no demo account; this is one of the very few drawbacks about this binary options broker. This is just your standard High/Low trade. You say whether a given asset will be trading above or below its current price when the trade expires. If you are right, you win the payout. If you are wrong, you lose your investment. Make money by correcting gauging the relative performance of one asset over another. You can make money even if both assets are falling, so long as you picked the one which is outperforming the other. These are High/Low trades with longer expiry times. These are High/Low trades which expire inside of a minute. This is a common type of binary options trade where you win money if the asset touches a certain trigger price before your trade expires. With this type of trade, you can make small incremental profits as price climbs a “ladder” with different strike points defined as the rungs. If you pick a solid trade and price climbs or falls as you predict, you can earn up to 1500% in profits! Porter Finance looks to really have it together. 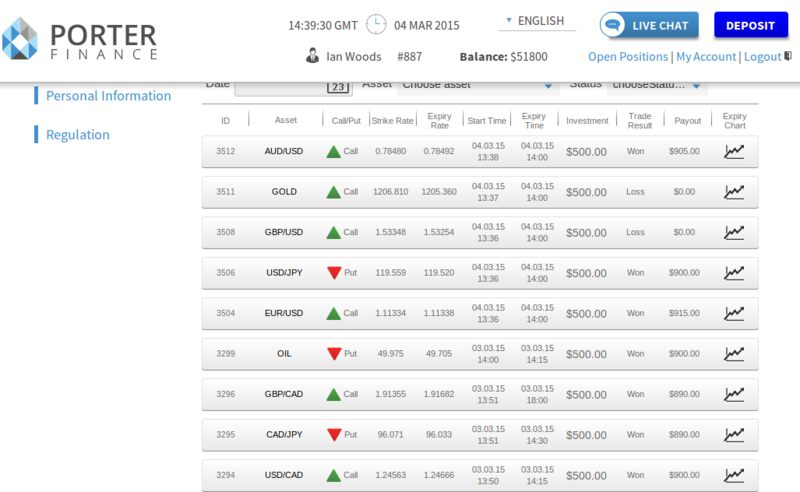 The only major drawback we found was the lack of a demo account, though they do offer risk-free trades. In all other respects, they look to be an excellent broker. Their website is well-organized, easy to navigate, and informative. They offer many different ways to trade, and provide their clients with an abundance of learning materials. Withdrawal fees and thresholds exist, but they are not too stringent. They have a solid reputation for great customer service. While they are not regulated, they seem to understand regulations more clearly than many companies that actually are regulated, and they take USA traders. We give them a high recommendation! If you want to get started, just visit www.porterfinance.com to register your account. The minimum trade is only $10 so you can practice with small trades as long as you want. Good luck with your trading!